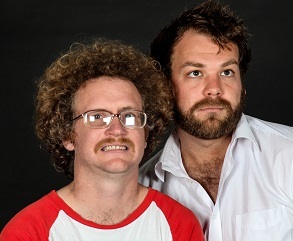 Hilarious Cape Town stand-up comedy duo – Stuart Cairns and Westley Cockrell – will visit Durban to present their highly energetic show about the whacky journey of becoming stand-up comedians! Directed by highly acclaimed comedian/director, Rob Van Vuuren, The Plothole delves into the lives of two odd-ball characters as they explore the process that goes into creating comedy and the hilariously embarrassing trials and tribulations that many comedians face while pursuing comedy careers … from keeping a day job, to impressing their parents, to “dying” on stage! Their creative use of props and audience interaction guarantees an hour of hearty laughter! The show has been a smash hit at the Grahamstown National Arts Festival for two years running, as well as enjoying critical acclaim from consecutive sold-out runs in Cape Town and Johannesburg.